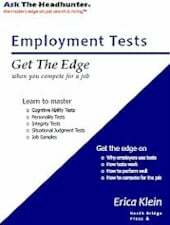 Home » Employment Tests: Get The Edge | NEW BOOK! Nick–Check this article http://online.wsj.com/news/articles/SB10000872396390443890304578006252019616768 from the WSJ about Xerox using a personality testing to hire call center workers. It’s a bit creepy. The companies that use screening tests unwittingly reveal their corporate personality by the choice of test. I dodged a disastrous career move where the screening test had nothing to do with the job. The test had probably been been bought up by some HR guru without consulting the engineers who interviewed me for the job. The test was a strange mixture of the old MMPI personality disorder test (recognizable from Psych 101) and pointless calculations such as cube roots and statistics. When the project manager called with an offer (I had the top score), I declined. Turned out the company folded a year later in the midst of a nasty lawsuit over selling equipment containing trojan horses. I recall a personality test I took once. After the first few questions, I looked ahead and saw that the test consisted entirely of four questions. Each question, with the same set of multiple-choice answers, was repeated many times with variations in wording and incidental details to conceal the similarities. The questions had ethical implications, so the similarities were generally far more important than the differences. I accordingly gave the same answer to each of the four questions every time it appeared, disregarding the variations except in a few cases where they were not trivial. I wasn’t doing this to play games with the test. I just couldn’t think of anything else to do. I got a pathologically low score, far outside the normal range–because my reading and thinking skills were better than those assumed by the people who put together the test. Just like HR people, psychologists are generally given a blank check by their employers as far as credibility is concerned. Accountability is rarely a factor. The results are the same. People in core production functions don’t get that blank check, and smoke-and-mirrors generally doesn’t cover them when they consistently get bad results. Guess which group tends to be smarter. You can’t devise competency tests for people who are more intelligent than you are, who have mastered skills that are judged sharply by real-world results. Even general psychological research, on which the tests are based, is very often subject to the same debasement. Check out this recent article in Science News: “Closed thinking: without scientific competition and open debate, much psychology research goes nowhere”, at https://www.sciencenews.org/article/closed-thinking“. Especially for people who can pick and choose between job prospects, and above all for people with a record of success, picking the right employer means picking one who doesn’t use any such tests. When I was in college taking psych 101, we were required to participate in 10 experiments put on by grad students. I signed up for my 10 and thought nothing of it, until I got a call from a full professor asking me to come in. Turns out I had taken a modified Myers Briggs test and I had an unusual score. So the prof asked me to take a formal Myers Briggs test. I did. My score was STRONGLY dominant in 2 areas and subdominant (but almost dominant) in a third. The prof used this score to show the students that all rules about humans are subject to being broken. Can you imagine what kind of results I’d get if an HR flunky saw a score like that? I’d be miscast 3/4 ways. That’s why I don’t take psych tests given by employers. The Myers Briggs is not valid for use for selecting employees – I agree if a company used that test, they are making improper use of the test. The company that owns the MB makes it clear that employee selection is an improper use. @Chris Walker – thanks for the link – the WSJ article does a nice job of explaining how a personality test can be used to predict tenure. Companies that make a big investment in training want to select employees who are more likely to stay. This topic reminds me of a test I took long ago in Chicago. The job was to create a very confidential membership database for a non-profit that counted quite a few celebrities in its listings. The manager was fixated on enneagrams, a metaphysical method for matching personalities that was a minor fad at the time. The testing was both verbal and written, and struck me as odd, but who knew? Anyway, I passed and was hired – and six weeks later we agreed to part. I’m not putting down metaphysics, and I’m reasonably sure she thought she was doing what was best for the organization (or maybe I was the only viable candidate for the night shift in the middle of winter). And this was in the old days before so many legalities came onto the scene. I’m just saying there are a lot of ways to test potential hirees, and it’s up to the individual to determine whether the job is worth it. @Chris Walker-creepy indeed! But employers think this is the bees knees of hiring these days. @MWilson- Dead on! If they don’t incorporate their total human instinct and gut in the hiring process, something is definitely off. I do not think tests accurately define and pinpoint the “best” viable candidates. oh and @Ken Dezhnev, I agree with mostly everything in this article. Articulately and well written about how psychological science operates. My thesis was based on a similar observation about judgment and biased and closed thinking processes. Thanks for sharing! A company wasting their time on psych test for professional employees is telling you they don’t know how to hire. Hiring is the most important professional challenge. Why do you want to work for a company that can’t perform again? Companies that make a big investment in training want to select employees who are more likely to stay…..
@Erica Klein, You are correct but I’m old enough so that I was tested (in the dark ages) when MB was considered THE test to take. And despite the fact that it’s shine has been reduced, a lot of companies still use a modified form of it, even today. If a person takes that test, it is subject to mis-interpretation because the HR version is a short form of it. And it is subject to min-interpretation because people’s personalities don’t fit in boxes. That is why I brought my experience up for discussion. Tests may have a place, but more and more it seems HR uses tests to avoid being accountable for hiring decisions. You’re right: They simply don’t know how to hire. It’s long past time that C-level management took a hard look at the assumptions their companies are making in the hiring process. Good post and discussion this week. It seems to me that tests are the latest thing HR uses to screen OUT applicants, when ATS, keywords, and computerized methods aren’t enough. God forbid that anyone actually use their brains, or meet and/or talk with applicants first. Shame on management for letting HR get away with it. That said, SOME tests do have their uses; in one of my first jobs after college, I worked for a management consulting firm, and sometimes the consultants used the MBTI test, but the purpose wasn’t for hiring but one of many tools to help businesses improve. It doesn’t make sense to use it as a way to screen applicants or as a way to try to figure out who to hire. I just took a test for a large Internet company. While I think it is a step in the right direction, there are some constraints with testing, especially technical ones, over the iInternet. @Dave: Oy vey. Internet testing. Like that isn’t prone to all kinds of problems. ATSes work so well, might as well do testing over the internet. I used to score those MBTI tests, in that job with the management consulting firm, and everything was done ON PAPER back then. Paper didn’t have system failures, didn’t kick you out, time you out, or get stuck. Great observation about internet testing. How can they tell if it’s really you taking the test and how can they tell if you get help or cheat? 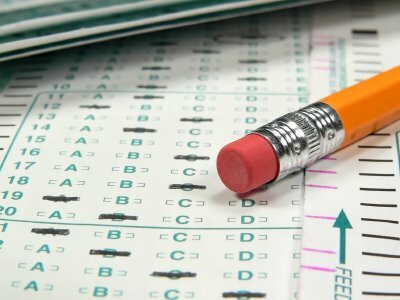 One thing to watch out for – sometimes you might be asked to take the same test a second time, this time in a proctored (observed) setting and if you score significantly lower, the employer might assume you cheated the first time. They record your session on the website. Part of the problem I had is that they put time constraints on it – so it does breed a bit of cheating. If you fail a personality test, are you never likely to get a foot in the door at the company who administered it? I fear the answer is yes, because HR people are overlooking experience and everything else in favor of these tests… and because most people believe you can’t teach attitude. Skills can be taught to you, but personality most people think is baked into the cake. A lot of companies prefer to hire extroverts. Now, I’m not the most introverted person in the world– I’m about the 55th to 60th percentile of extraversion– but with all the emphasis on soft skills and emotional intelligence, I worry that’s not good enough for the majority of American employers. My precise situation is, I enjoy being with people unless I sense they won’t reciprocate. The problem is, that’s pretty frequent. When very often happens is I put myself out there, and people don’t reciprocate. (Not “like”– respond to me in the way I hope they will.) And you can’t force someone to reciprocate your social overtures… they have to enthusiastically consent to it. Because my guidelines are pretty stringent here– I don’t think my outgoingness counts unless I’ve gotten enthusiastic reciprocation– I’ve never felt particularly socially adept, and therefore I feel like a lot of jobs are closed to me. Even more, with this testing craze potentially outweighing everything else I, or any other job applicant, bring to the table. –like I pursue my hobbies and pastimes at my peril; lest the “wrong” combination of passions and interests mark me as “not a good fit” for a certain job. I’m probably reading a lot more into this than I should; but the way they are often used to disregard everything else about a person has snuffed out my belief in myself and put the kibosh on my hustle. I mean, really, Xerox? Creative people are likely to stick around in the job but inquisitive people aren’t? Don’t creativity and asking lots of questions go together like peas and carrots? @Lucy, if you are excluded from a job because of your score on a personality test, you are not necessarily excluded from that employer. First, some jobs have specifically tailored personality profiles so your results may exclude you from one job and include you for a different job. Second, many employers do not save personality test results for very long so each time you apply you might get to take the test again. Your score will vary since people seldom give the exact same answers each time. Usually your score won’t vary by much but maybe enough to get a passing score. @Erica thanks for the response. I feel better assured. It’s just hurt so much over the years.